If you consider the lack of Amazon Kindle applications for the Linux desktop a nuisance, you will appreciate the recently launched Kindle Cloud Reader browser app that works with Google Chrome and Chromium on Linux. Although this app doesn't provide all the functionality of the Amazon Kindle desktop application, the Cloud Reader is a rather slick solution for reading books bought via Amazon Kindle without leaving the convenience of your browser. Installing the Kindle Cloud Reader is as easy as visiting https://read.amazon.com in the Chrome or Chromium browser. You will be prompted to install a browser app, and once you've done that you can access and read all your books purchased though the Amazon Kindle Store. The best part is that you can download and pin books, so you can read them offline. 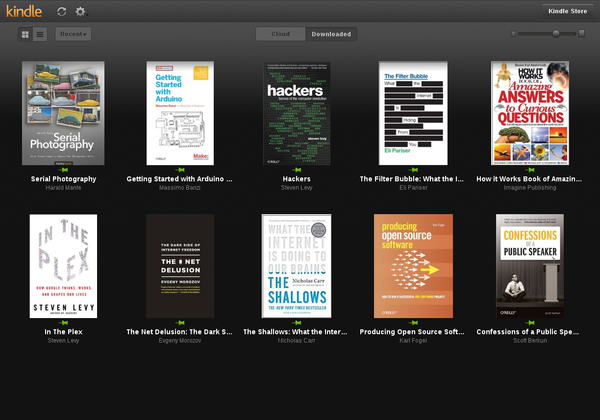 Kindle Cloud Reader's interface is slick and user-friendly, so you shouldn't have problems finding your way around. A handful of buttons at the top can be used to navigate to specific parts of the currently viewed book, tweak viewing settings, and add bookmarks. While the reader app can also handle existing notes and highlights, it doesn't allow you to add new ones. This is the only serious drawback of the otherwise competent reader. Similar to other Kindle applications, the Kindle Cloud Reader syncs your current position in the book, so you can continue reading it on another platform. As you would expect, Kindle Cloud Reader integrates with the Amazon Kindle Store which is only a click away. And as soon as you buy a book, it immediately appears in your reader's library. Frankly why bother with lower functionality given that the Kindle for PC program works perfectly well under Wine (according to WineHQ) and certainly works correctly under Crossover. I don't see why using the browser necessarily makes this better than an installed program.